A family farm more than 230 years old. Our grass fed beef is certified hormone and antibiotic free and is humanely processed. 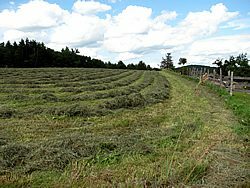 Our family produces maple products and compost for sale. Our beef, pork, maple products and compost are offered at our store along with a beef CSA. Give us a call to make sure we are close by to assist you. 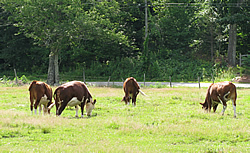 Bridgmont Farm offers a six month certified grass-fed, dry-aged Beef CSA. Pick up is the first Thursday of each month, 3-6pm, at the farm store.Half and whole shares are available. Our Hereford and Angus cross cattle are raised on pasture and our own and locally harvested hay. We do not supplement or finish our cattle with grains or use added hormones or antibiotics. Our beef is processed under federal USDA inspection in Athol at Adam’s Farm. Their new facility is designed using the Temple Grandin theory for humane slaughter. Our plan will allow families to buy meat at a great price and receive it monthly in quantities that will fit in their regular size refrigerator-freezer. All of our meat is flash frozen, labeled and vacuum sealed.